Try serving this dish with orzo tossed with butter and grated Parmesan and a salad. Dry the rinsed shrimp well with paper towels and set aside. Put a colander or large strainer in a bowl and set it beside the range. In a large skillet set over high heat, melt 1 Tbs. of the butter. When the butter froths, add the shrimp and season well with salt and pepper. Stir several times as the shrimp cook — they may brown slightly, which is good. They’re done as soon as they’re just cooked through and opaque, 3 to 5 minutes; cut one in half to check. Remove the pan from the heat; transfer the shrimp with a slotted spoon to the colander. 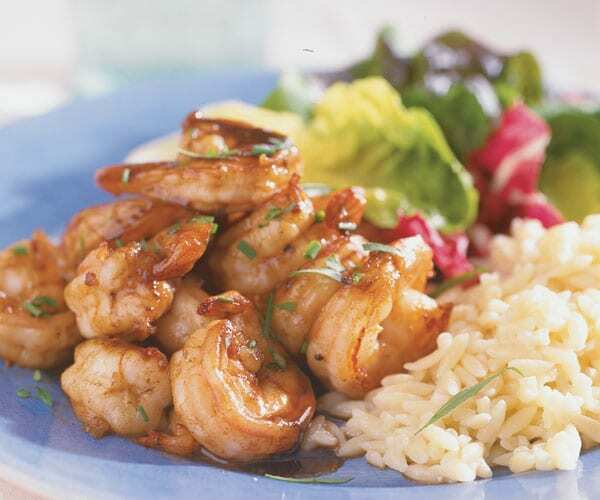 Cover the shrimp loosely with foil and set aside to keep warm while making the sauce. Pour off all but 1 or 2 tsp. of liquid from the pan. Set the pan back over high heat and add the remaining 6 Tbs. butter, swirling the pan once or twice until the butter turns light nut brown, about 2 minutes. (Any brown bits that have stuck to the pan will become even browner, but they shouldn’t burn.) Immediately pour the balsamic vinegar into the pan and start scraping up the brown bits. Continue to scrape and cook until the sauce thickens somewhat and starts to appear glaze-like, about 2 minutes. The sauce will reduce to a scant 1/2 cup. Turn off the heat and stir in the drained shrimp (discard any accumulated liquid in the bowl) to coat them lightly with the sauce and briefly rewarm them without cooking any further. Taste and adjust the seasonings, if necessary. Sprinkle with the fresh herbs and serve immediately with lemon wedges, if desired.